I walked into my grocery store the other day and noticed strawberries on sale. They looked so red and juicy I couldn't resist buying some. I started off with one big container in my cart then proceeded to go up and down all the other isles to get the things on my list. While I shopped I kept looking at the strawberries and thinking of things I could use them for. I knew I was totally out of jam and I could always use them for other things to. Eventually I ended up back to where the strawberries were and I just had to buy more. I ended up with 4 large containers of them. I made 2 big batches of strawberry freezer jam but still had strawberries left over. What to do, what to do. Seriously, there are so many possibilities. Then I remembered an amazing pie my sister Mary makes. She only makes it about once a year and then we crave it for the rest of the year. I decided to change it up a bit and add strawberries instead of the other fruit she uses and opted for a light graham cracker crust. My family loved it. We will definitely be making this pie again. Put whipping cream in a bowl and mix with electric beaters on high until thickened and starts to form soft peaks. Then in a separate bowl, mix cream cheese, sugar, and vanilla till well blended. Add cream cheese mixture to the whipping cream and mix until well blended and stiff peaks form. Spread equally between 3 pie crusts. (If using standard size pie crusts or 2 if using large pie crusts) This layer should be about 1 inch thick in your pie pan. 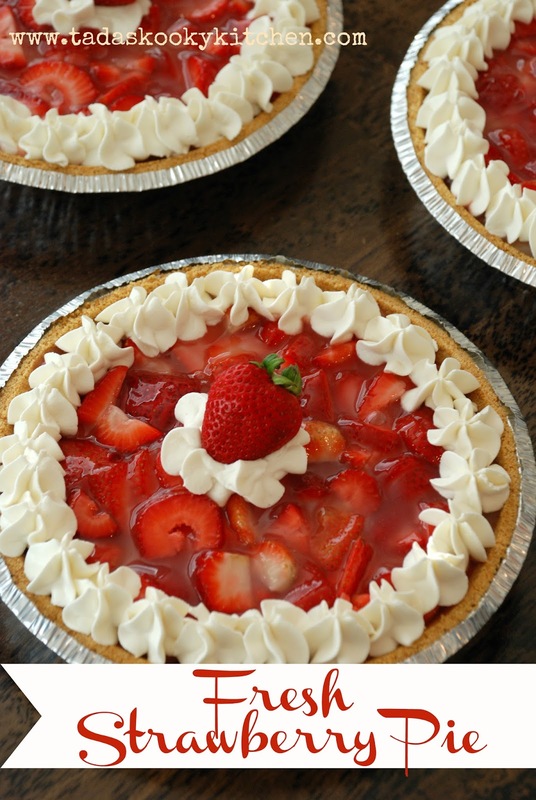 Fill each pie with fresh strawberries, (washed, hulled, and sliced) About 2 cups for each pie, or more if desired. Cook sugar, water, and corn starch until thick and bubbly. Pour over strawberry filled pie and then place in refrigerator to chill for at least 2 hours. Top with whipped cream just before serving (optional).